Wisdom of Life. : Life is like a boomerang. This story i related many times..
An old man wanting to go for a weekend fishing trip, called excitingly his son to join him. The son being an active successful professional answered, "Dad! I am sorry! I have an urgent business meeting this weekend too and i cannot join you. Let me give you five hundred dollars so that you can spend on the trip". The old man was sad. Recalling his past, he remembered when his son was a boy, he too had requested his father to join him on many fishing outings. As a responsible and hardworking parent then, he told his son, "Son! I am sorry! Dad needs to work this weekend and i cannot come along with you. Please have five dollars and you have a good time with your friends. Ya?" He was sad because he had no time for his growing boy and the son did what the father had thought him. 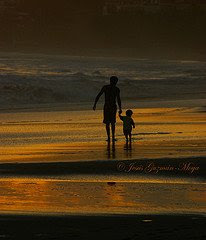 Should the father had given the quality time to the son, today the son would have given the same treatment to him now. "You harvest what you sow in the first place". I told this story to my son and daughter in law, and hopefully it would also benefit those who are raising their young families like them. My belief - "Life is like the return of a boomerang you throw". I think this applies to friendships too, not only raising families. I threw you the friendship's boomerang, and you threw back with love. Thank you so much.